That’s 34 years of Hertsmere General Election voting data, from the Thatcher high water mark of 1983 (the biggest landslide since Labour’s 1945 win, you’ll remember) to 2017’s most surprising result, via that other high water mark – Blair’s even bigger 1997 landslide. The Hertsmere Parliamentary constituency has only existed since 1983. Before it there was a constituency called South Hertfordshire that itself only lasted for three general elections. Cecil Parkinson, a close ally of Margaret Thatcher, held the seat from 1983, when he also ran the extraordinarily successful Conservative national campaign. He was replaced, after a particularly egregious scandal, for the 1992 election, by James Clappison, who went on to be a popular and hard-working constituency representative for five Parliamentary terms. Clappison was summarily dumped by his party for the 2015 election, though, to make room for David Cameron adviser Oliver Dowden. Dowden himself has spent the last two years building a reputation for hard work and commitment to the constituency and he has, of course, now been re-elected with a higher share of the vote, although a slightly smaller majority. What all the results in the chart have in common, of course, is the winner. Hertsmere has been a comfortably Conservative seat throughout. Even the Blair revolution, in which Labour took 418 Parliamentary seats, the largest number ever held by a UK party, couldn’t (quite) touch that and, although Fiona Smith has lifted the party further from that dreadful 2010 result, the Corbyn uprising has done essentially nothing to close the gap. In some ways, the Liberals’ trajectory in the constituency since 1983 is the grimmest of all – steadily falling from a quarter of the vote and second place ahead of Labour – to little more than 5% this year. That’s a snapshot of the national challenge for Farron and his party. This chart shows the Conservatives’ winning majority in Hertsmere, over the 34-year period. You can see just how close things got in 1997. It’s fascinating to note how long it’s taken the party to recover from that enormous electoral shock. And this chart shows turnout over the same period. To keep the top chart simple, I’ve left out the minor parties – the levitating transcendentalists from the Natural Law Party (please watch their 1994 European Parliamentary election broadcast); James Goldsmith’s Referendum Party, whose programme looked pretty kooky at the time but now looks like a model of sanity; the Independent Communist candidate whose vote exceeded 2% back in 1983; Arthur Scargill’s Socialist Labour Party and the BNP, whose Daniel Seabrook ran once in 2010 before being rendered entirely irrelevant by UKIP. The smaller-party numbers are all included in the raw data, though, in case you’re interested. There are five candidates for the 2017 election in Hertsmere. That’s one more than in 2015 – the Greens have returned to the fray. Here’s what we know so far. I’ll add more here as we get it. Oliver Dowden, Conservative. The incumbent. A local man and a former Cameron adviser, helicoptered in by CCHQ for the 2015 election, he’s managed to retain his relevance in the May era, principally by the simple expedient of absolute loyalty. You won’t find a single vote in defiance of the whip in his Parliamentary record and he’s been heard saying “strong, stable leadership” on a number of occasions, including on this episode of Radio 4’s Westminster Hour in April. David Hoy, UKIP. Chairman of Hertsmere UKIP. Hoy stood in the 2014 and 2016 local elections. He’s on Twitter, where his bio reads: “Don’t care I will do it anyway”, although he hasn’t tweeted since Donald Trump’s inauguration in January. Joe Jordan, Liberal Democrats. Jordan’s a software engineer and a scientist (with a doctorate). He’s a Liberal activist from Huntingdonshire, where he’s been looking after social media and the web for his local party. He stood in Royston at the 2015 General Election. He’s set up a web site for his Hertsmere campaign and he’s on Twitter (and he’s definitely the only candidate to have his own comic book-style custom Twitter avatar). Fiona Smith, Labour. Interestingly, Smith has served in both the military and the police force. She’s on Twitter and recently found herself explaining a tweet critical of Israel sent in 2014 (although it looks like it was a tweet sent automatically when she signed an Amnesty online petition). She supported Liz Kendall in the 2015 Labour leadership election so is unlikely to be a Corbyn loyalist. Sophie Summerhayes, Green Party. Summerhayes joined the Green Party “just before the green surge in 2015” and she’s co-founder of Watford Young Greens. She’s also on Twitter. Jewish News has some more detail on the candidates. I’ve made a Twitter list for the Hertsmere candidates – follow it to keep up with their tweets during the campaign (Oliver Dowden doesn’t seem to be using Twitter at the moment). It was never going to be the most exciting of elections for us in Hertsmere. No earthquake for us. It’s a Conservative hold, of course (as it is across Hertfordshire). And the Hertsmere numbers tell the national story pretty well. Conservative, Labour and Ukip all saw increases, both in absolute numbers and in share of the vote. And the source of those extra votes? The Lib Dems, by and large (an increased turn-out also helped – it was 65% in 2010). Share of the vote for the party whose candidate was reportedly too busy to campaign fell by a wapping 11.8% to 5.5% (2,777 votes – she’s just retained her deposit) The biggest gainer was Ukip, whose share jumped by 9.1%. Ukip candidate Frank Ward polled more than twice as many votes as Sophie Bowler (6,383). For Hertsmere, there’s the story. Stay tuned for the Hertsmere borough and Aldenham parish election results, which we should have from about 4pm today. If you voted for the BNP or for the Greens at the last general election and you were thinking of doing so again this time, you’re out of luck. Neither is standing in Hertsmere in 2015 and the deadline for candidates to get their names on the ballot has now passed, so that’s it. Between them, in 2010, the two parties attracted around 2,000 votes or 4% of the vote. According to Buzzfeed “almost Everyone In England And Wales Will Be Able To Vote For The Green Party”. The Greens are putting up candidates in nearly 95% of UK seats (535 out of 573) and around 40% of their candidates are women, the highest proportion for any party at the general election. Before the deadline passed, I reached out to the 2010 Green Party candidate Arjuna Krishna-Das to ask if he planned to stand but it turns out he’s no longer Green and, in fact, he’s now supporting a right-wing group calling itself Liberty GB. The task of gathering nominations for elections falls to local authority Returning Officers. 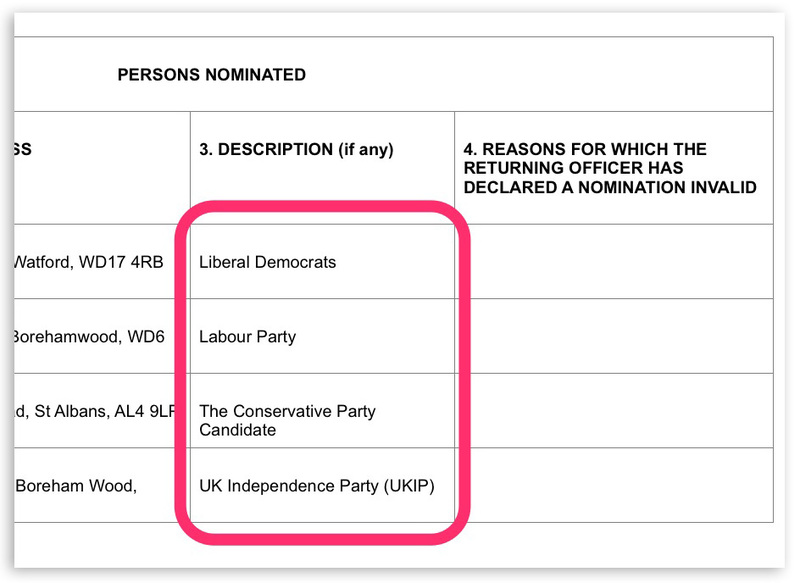 You can download nomination documents – including those for the Borough and Parish council elections – from the Hertsmere web site and, for reasons which presumably pre-date the World Wide Web, you can pick them up in person from the council offices. The Your Next MP web site, has up-to-date lists of candidates for the whole country and you can add information yourself, where it’s missing.